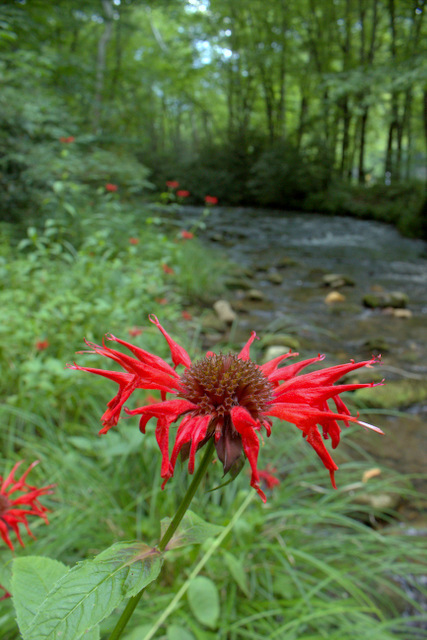 Some of my favorite experiences in the Smokies over the years have involved camping trips with a healthy dose of fishing thrown in for good measure. When some time was freed up a couple of weeks ago, I decided to make a last minute run to the Park for my first camping trip in quite a long time. The destination was Cataloochee Valley, one of the places where elk are again roaming wild in the Park after their successful reintroduction several years ago. The elk are just one of the reasons I love camping in Cataloochee although I must say that they have increased the crowds there a lot. When people ask me where my favorite place to fish is, I always have to pause and think. Little River would probably be at the top of that list, but the rest would shake out differently each time depending on the day and my mood. Cataloochee always deserves a place near the top of that list. 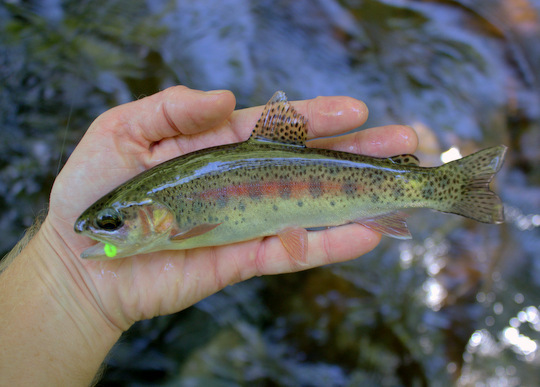 The reasons are much more complicated than great fishing and in fact if fishing was the main goal, I probably would not choose Cataloochee for a trip. The fishing is just about as good as anywhere else in the Park but certainly not better. 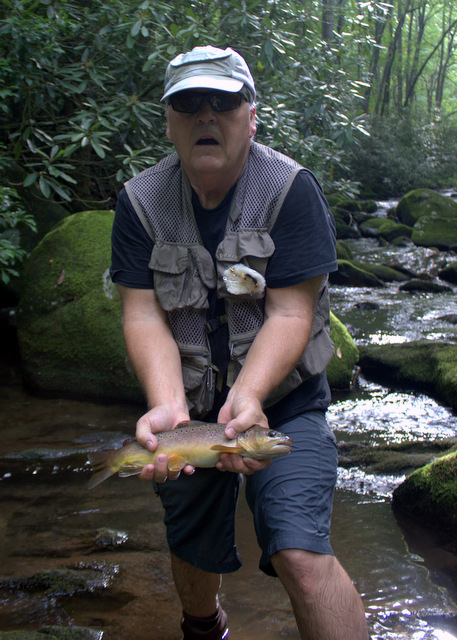 The remote nature means there is more water available per fisherman which is beginning to come closer to the truth of why I love Cataloochee. For my most recent trip, I decided to take the scenic route and drove in from Big Creek which is a good enough fishery in its own right. On the drive over, I stopped to sample a couple of small tributaries ranging from very tiny to just barely fishable. I was happy to discover brook trout just where they were supposed to be although getting a fly to these fish was challenging to say the least. Continuing my drive, I arrived at the campground and quickly ate my lunch. I headed back out to fish again and stayed close to camp. In a couple of hours of fishing, I didn't catch anything particularly noteworthy or memorable but did experience one of those moments that seems to always happen and make my trips to Cataloochee exciting. I was headed down to the creek and was close to bushwhacking but had found a faint path to follow. When the sound of water grew louder, I looked up and realized the path I was following dipped under a bridge. A flicker of movement soon materialized into a doe which stared back with little apparent fear. A brief moment of anxiety over whether she had a fawn close by caused me to quietly talk to her while moving slowly around to give her plenty of room. She watched with big dark eyes but soon couldn't stand the close encounter any longer and bounded off through the rhododendron. The same rhododendron that would take me hours to navigate I might add. I watched as she contorted her body in each jump to slip between the branches and was amazed at the body control she was displaying. The moment was fleeting, and soon I was staring at an empty spot where she had disappeared. That is why I like Cataloochee. Special things always seem to happen there. Being a good fisherman, I was there to fish as well. It was time to quit staring at the brush and try to catch some trout. As it turns out, the fishing was good just like I remembered it being. Could I have caught just as many fish closer to home? Probably, but it was nice not competing with other anglers and don't even get me started on all the swimmers and tubers on Little River right now. The fish seemed keyed in to terrestrials with the best action being on inchworm imitations and beetles. Caddis were also out and about and a caddis pupa was like candy to these fish. In fact, on day two, the caddis pupa worked even better than the terrestrials for the most part. Soon enough, my time came to an end, and I had to head back home to the responsibilities of life. I was refreshed from my time camping in Cataloochee and ready for the six straight days of guiding fly anglers the next week. 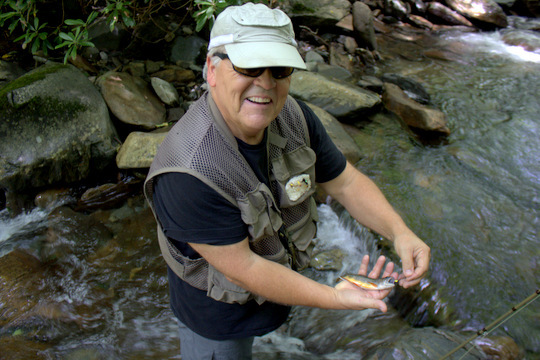 Here is my stay at Cataloochee in pictures, which to me does a better job at capturing the essence of the fishing there than words ever can. 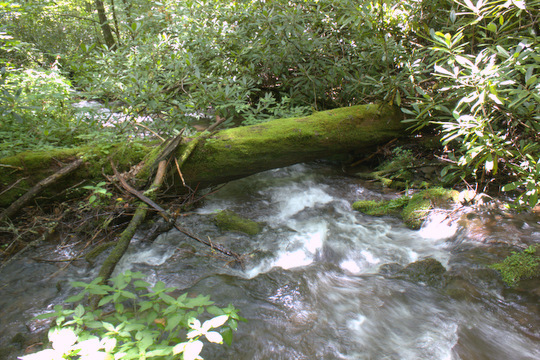 Cataloochee Creek is a gentle, largely low-gradient stream. 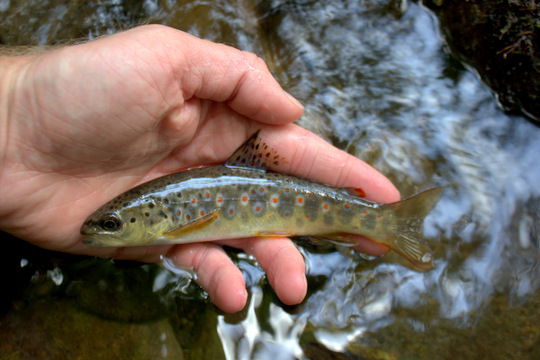 ...and this little brown trout. 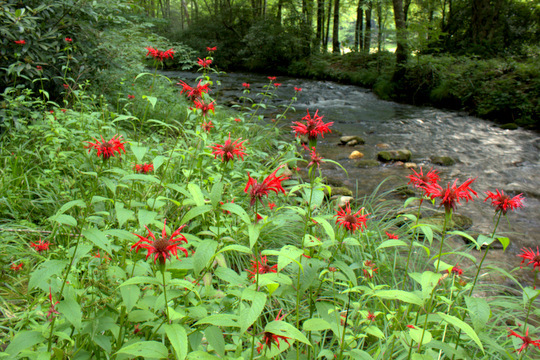 ...providing bursts of color upon the stream banks. 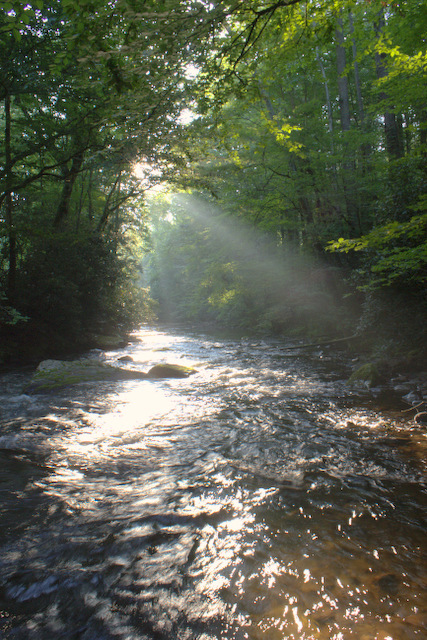 Morning in Cataloochee breaks forth on Cataloochee Creek in blinding shafts of light. Some of the rainbows were nice sized. 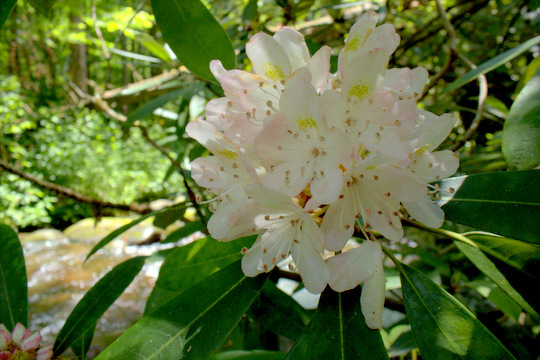 There were even a few rhododendron still blooming along the streams. For now I'll have to wait, but I'll be eagerly looking forward to my next adventure camping in Cataloochee. This is your yearly reminder to be careful out there! There are lots of dangerous critters including timber rattlesnakes that are on the move and more aggressive than normal from now through August and into September. By October, things should be slowing down. This time of year, we see the bald-faced hornets making nests over the creeks up in the Smokies. In fact, just last week I got nailed by one after a client's failed hook set caught a branch with a nest hanging from it. We never saw the nest until it was too late. Earlier this week, I almost had another run in and just yesterday, we counted 3-4 nests just on one short section of stream. Always take time to look around before casting, especially this time of year. Of course, it is a good idea to do that anyways to find where your obstacles are, but especially for safety purposes right now. Something else to be careful of right now are the snakes. 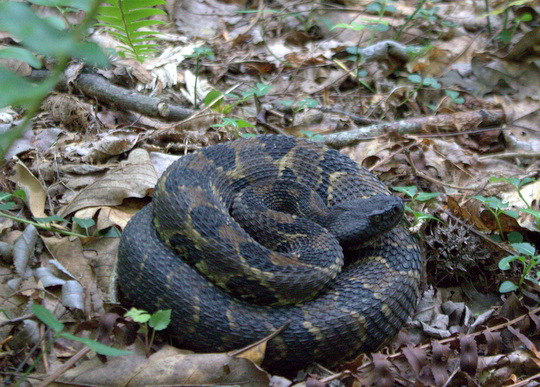 On Monday of this week, we saw a timber rattlesnake in the woods on a guide trip. I warned the guys that sometimes the timber rattlesnakes will be down along the creek and even swim or be on rocks in the middle of the creek this time of year. Last evening, one of them emailed me to tell me that they had indeed seen one swimming in the creek and included a picture from after it crawled out on a rock mid-stream. Here is the snake we saw during the guide trip. In other words, the woods are a bit dangerous right now. That doesn't mean you shouldn't be fishing or hiking. On the contrary, this is an excellent time to be out fishing but be prudent when moving through the woods. Don't stick your hands into any dark holes or reach up over rocks while climbing around in the stream unless you can see where you are reaching. Watch for yellow jacket nests and hornet nests. In addition to the timber rattlesnakes, be on the lookout for copperheads right now also. In general, be mindful of your surroundings and you should have a great time out there! One of my favorite things about camping is getting out on the water early in the morning. Getting to enjoy a stream without competing for space is a luxury normally reserved for winter time when the fish may or may not be awake. However, those willing to get out early or stay very late can sometimes have the stream to themselves. Being the only person on planet earth blessed with this view was special to say the least. 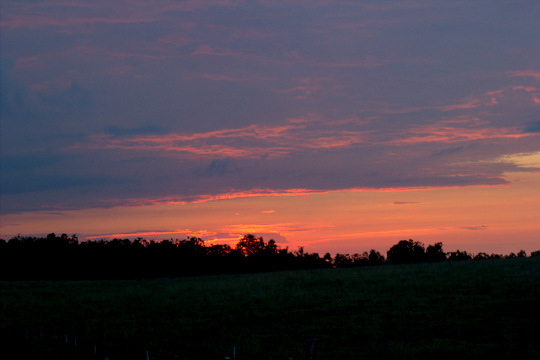 Living on the Cumberland Plateau and guiding both to the east and west of home can get tiring. 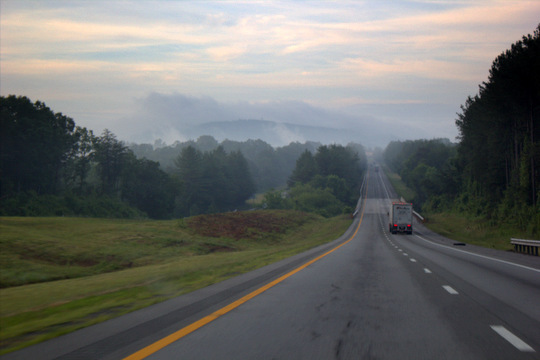 Driving the 1.5+ hours to the Smokies and back every day gets old, but the scenery never does. I'm often traveling both early and late in the day (think sunrise and sunset) so I am blessed to enjoy some amazing scenes. Here are some pictures from the last few weeks. 'Tis the season for terrestrials and quality brown trout. I just saw another report with a similar theme from my friend Ben Smith over at Arizona Wanderings. He found big brown trout that were eating cicadas which is always guaranteed to be fun. Here in the Great Smoky Mountains of east Tennessee and western North Carolina, the annual cicadas are on but not in enough numbers to consistently get the fish interested. No, we have inchworms, ants, and beetles to get our fish interested. I've already experienced some good terrestrial fishing this year, both as a guide and an angler. Inchworms and ants provide good fishing starting in May and continuing through the summer. Fish get accustomed to looking for these delicacies. In June, Japanese Beetle season commences and the fish will eat a well placed beetle imitation. Yesterday, we were fortunate enough to experience some of everything during my guide trip with Kirk. 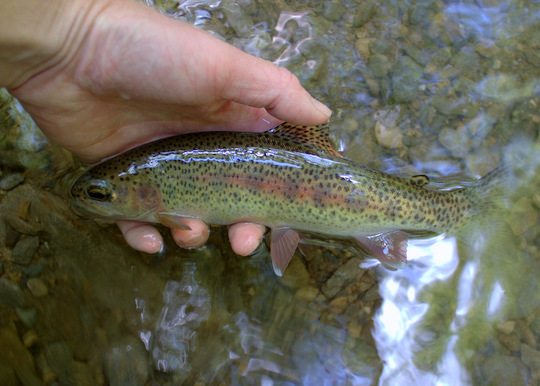 The day started fishing beetles and ants to high elevation rainbow and brook trout. During this time, we found some quality fish and the takes were always something special. Here are a couple of the rewards for stealth and accurate fly placement. Speaking of stealth, fish were spooking even before we could get into casting range at times. I recommend doing everything in your power to be stealthy right now. Wear camo shirts, get down and crawl on your hands and knees, make longer casts wherever possible, and most of all, know that you normally only get one shot so make the first cast count. As the number of landed rainbows and brookies continued to climb, Kirk and I started a discussion about whether or not to go looking for a nice brown trout to round out the day. Finally, we got to a good spot to get out of the stream and decided that we should go looking for a brown trout. I reminded him that the numbers of fish wouldn't be as high, but there was always the chance for a nicer trout of maybe 12 inches. 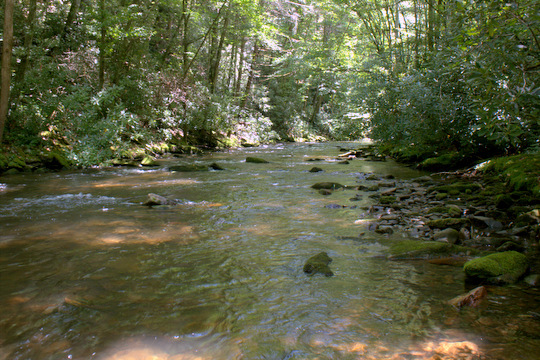 When we started fishing at our next destination, the creek was flowing at a perfect level to hunt quality fish. Early on, we missed a good 10-12 inch brown and had another couple of hits, but it took a while to catch the first fish which ended up being a little rainbow of perhaps 5 inches, definitely not the big fish we were hoping for. Moving on up the creek, I paused to discuss strategy if we should happen to hook a big fish and explained how to beach a large brown without injuring it. Most importantly, when beaching a fish, make sure that it is on a firm but level surface and that the surface is WET. Other than that, beaching is an acceptable method for landing a large trout but remember to hurry to get the fish back in the water. Shortly after, we got to a deep plunge that was well shaded. I pointed to the best spot and Kirk executed a great cast. After a second, the indicator plunged. I turned to ask if it was a rock or a fish and he was already in the process of saying, "That's a big fish!" As soon as the fish came up and rolled, my face grew as serious as his was. He was fishing my new Orvis Superfine Glass rod (7' 6" 4 weight) and had the advantage of a very forgiving tip in the fight against the quality brown trout. We had to follow the fish downstream through two sets of rapids before Kirk saw a window of opportunity and quickly gained control of the head of the fish and slid it onto a flat spot with a small pool. I pounced just as the fly popped lose and secured the big brown trout for a quick picture. I think both of us will dream about this fish, reliving the moment it came up and rolled and our mouths' both dropped open. Fish like this are more common than most people realize in some of our streams, but catching them is anything but common. In fact, a fish like this is often earned over many years of trial and error. Oh, I forgot to mention. It ate a sunken ant that I tie. Those ants are like candy to the trout as I have written about before. 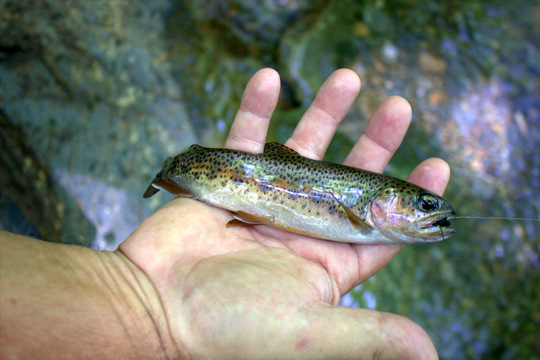 Check out that link for how I like to rig my ants for catching quality fish in the Great Smoky Mountains National Park. Days like this are special to me as a guide. Naturally I cannot guarantee catching a nice fish. In fact, if I had people catching them all the time, you would see a lot more pictures here of big fish. It is very satisfying though to have a plan come together and a nice fish hooked and landed. If you are interested in a guided fly fishing trip in the Great Smoky Mountains National Park, please contact me, fly fishing guide David Knapp, via call or text at (931) 261-1884 or via email at TroutZoneAnglers@gmail.com. Only another 2.5-3 months and my favorite season will have arrived. Yes, it is never too soon to start thinking about fall. 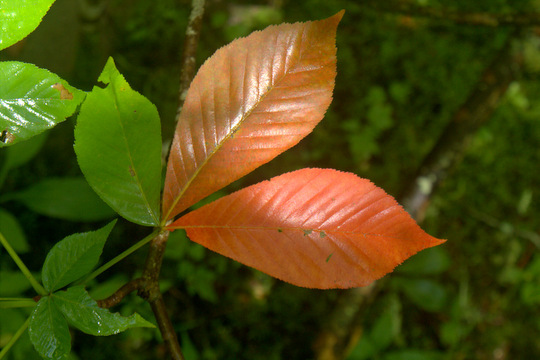 Every year, we start seeing some leaves changing colors in the middle of the summer. In fact, last summer, I was already looking ahead to fall by late June. This year, I've been dreaming of the cool dry months of fall ever since May arrived with warm weather and the humidity of summer. Now, I'm starting to see those changing colors. Too bad the main event is still so far out. This time of year is special too though. One can never fish too many small streams for gorgeous wild trout and what better time of year than the warm months of summer? 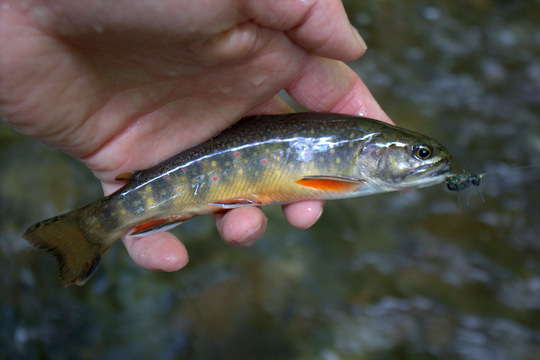 The high elevation brook trout streams are fishing well right now, finally replenished with some much needed rainfall over the last week or so with more on the way. 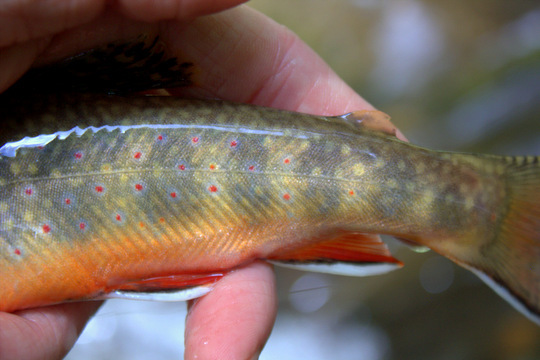 The fish in those high elevation streams are happy and more or less easy to catch. Obviously, if you ask me, I'll tell you that having a fly fishing guide will help and what better way to spend a day than with someone who can help you learn more skills to take your fly fishing game to another level? 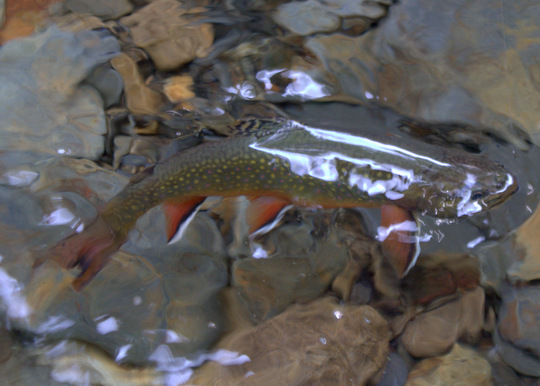 Here is one of many beautiful brook trout caught on a guide trip this past week which saw several more anglers learn the skills they needed to be highly successful in the Great Smoky Mountains National park. 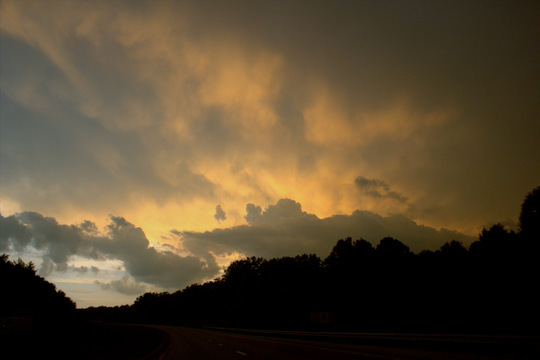 Those cloudy rainy days can be phenomenal if you happen to be there to enjoy them. 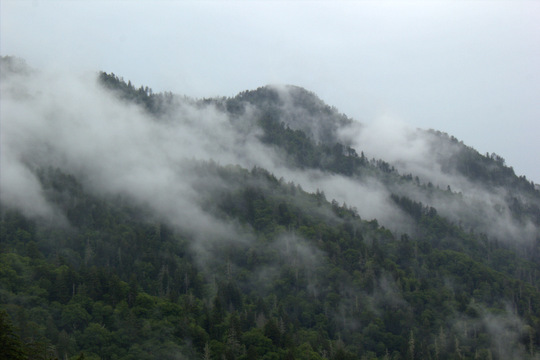 The low hanging clouds hug the ridges and ride the air currents up and over the peaks that together form the heart of the Great Smoky Mountains National Park. The fish like the low light associated with those cloudy rainy days. Just be careful if there is any lightning in the area and don't get surprised like I did. And don't get too caught up with the fishing. The scenery is worth enjoying as well. As I inched closer and closer to a major milestone here at the Trout Zone, I kept asking myself how I would celebrate. Would it be an epic trip report? A long essay? A special photography post? A major life announcement? In the end, I have realized that if I wait for the perfect post to materialize then it never will happen. Hopefully there will be many more posts here on the Trout Zone. What started out as a simple way for me to do trip reports for my own purposes has been around for quite a long time. For now it looks like it will still be here for a while, but of course I never know where life will lead. Right now, I'm just along for the ride and enjoying myself immensely I might add. Thank you so much for supporting this blog by reading what I put up here. It means a lot! Today I faced a really tough dilemma. All along, I had been planning to fish and in the Smokies no less. 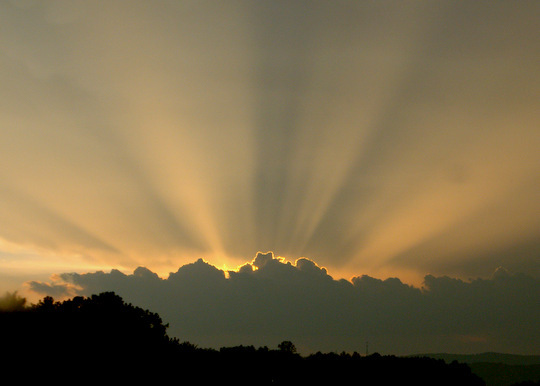 When the alarm went off at 5:00 a.m., the first thing I noticed was the flashes of light illuminating my bedroom. A crash of thunder followed the optical display. My first movement was to turn off the blasted alarm. The second was to reach for my iPad to check the radar. Rain everywhere with more on the way dampened my enthusiasm for crawling out of the comfortable bed. The internal struggle was intense, and I almost succumbed to more sleep. 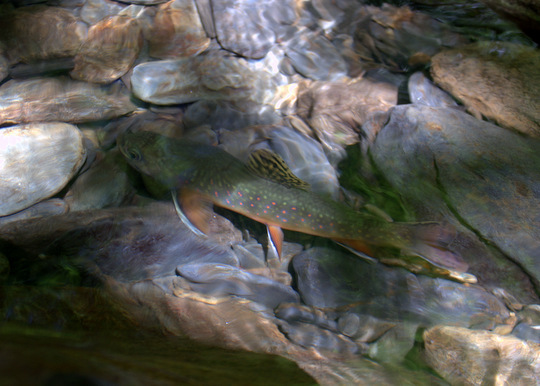 Then visions of big brown trout chasing streamers started dancing in my head, and I knew it was time to get going.There was no way I could sleep knowing that this might be the best fishing day of the summer in the Smokies. Score one point for my theory that fishermen are some of the world's greatest optimists. Rain was falling steadily as I loaded the few things that weren't already in my car. A cooler contained lunch and a couple of Gatorades. I also took along the waders with the assumption that it would be cool enough to wear them and they might help me stay dry. After a quick stop at Little River Outfitters to pick up the new Tennessee Guide License and a couple of fly tying items, I headed on into the Park. Despite several follows at my first stop, I didn't manage to hook up and was soon headed on up the river. At the second spot, I did have at least one flash and the third produced a good solid tug. Somehow all the fish were missing the hook though. My curiosity had been simmering all this time and finally got the better of me. I headed over the ridge to the NC side to see how conditions were over there. The rain had long since turned into a steady soaking rain, just the thing we've been waiting for here in the Great Smoky Mountains. My first stop produced a really nice rainbow. I would have kept fishing on further upstream but noticed the herd of elk before I stumbled dangerously close. I backed off from this first brush with danger and headed back to the Moose Magnet. Apparently it works on elk also. It was right about the time I got back to my car that I heard the first rumble. At the next top, I heard another one, far away to the south or at least that's what it sounded like. Then it was quiet, and I assumed that meant I should go fishing. By this time, I had soaked one rain jacket, switched to another while the first one dried, and then switched back to the first again. In other words, the rain was much more than what qualifies as light but something short of tropical downpour status. Scrambling along the thick stream-side vegetation, I paused to ponder poison ivy and was hit with the realization that it seemed to be a lot thicker this year. After trampling around through a lot of it today, I'll probably be fortunate if I don't end up with the miserable stuff. Anyway, so here I am thinking about poison ivy, standing in the middle of a drenching rainstorm with one of my favorite pools just ahead of me. Jumping into the stream, I decided it was probably safer out in the water. At least the poison ivy couldn't get to me out there. Working along the pool, I was almost to the top when it happened. Out of the hazy water, a dark shadow materialized under the hopper that was doubling as a strike indicator. I barely had time to think no way to myself before it inhaled the Chernobyl. Yeah! Then came the shocker, if you will pardon the pun. Right as I leaned down to grab the fish, as my hand slipped under the beautiful rainbow trout's body, a bright flash flickered across the sky followed almost immediately by a thunderclap that would have caused me to levitate out of the river if I hadn't seen the flash first. The timing was absolutely crazy. It has to mean something, right? But what? The fish gods weren't angry or else I wouldn't have caught that fish, or at least that's what I assume. Maybe it was just Mother Nature reminding me to not take anything for granted. Either way, I've never felt so relaxed after a close call with lightning. I actually just shrugged and decided to keep on fishing. After all, it was far enough back to the car that I was probably just as likely to get struck walking back as to keep on fishing. 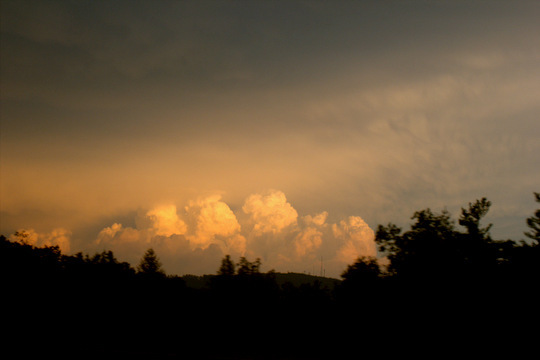 In hind sight, it occurs to me that the lightning and thunder were the last for the day. It rained quite a bit longer, but no more lightning. In fact, by the time that I decided to leave soggy North Carolina behind, Tennessee had turned sunny. The low hanging clouds burned off and left a beautiful day in their wake. Back on Little River, I managed another small rainbow, but somehow my heart wasn't in it. The day had already been amazing, and I decided to not push my luck. I know enough to quit while I'm ahead. The drive down Little River road was just about the slowest you will ever see me drive. The tranquility of the Park had worked her magic, and I was revived and rejuvenated again. Back out in the real world, the hurry didn't come back until I was well along on the Interstate. I guess I already need another lightning strike to put things back in perspective. Do you have any other ideas for what the random lightning strike means? I want to hear them. 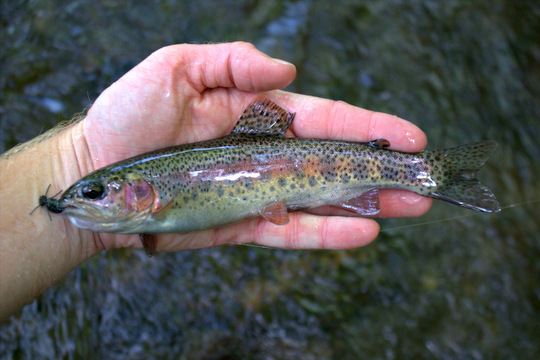 Learn why the fishing is improving so much across middle and especially east Tennessee in the July Newsletter from Trout Zone Anglers!